Home / Blog / Can a Broken Orthopedic Surgery Care System Fix Itself with Interventional Orthopedics? Can a Broken Orthopedic Surgery Care System Fix Itself with Interventional Orthopedics? For many reasons of perverse incentives, the American healthcare system is the world’s most expensive way ever devised to deliver healthcare. One of the biggest line items in any health plan is elective orthopedic surgery costs. Hence, reducing that cost saves any employer big bucks. 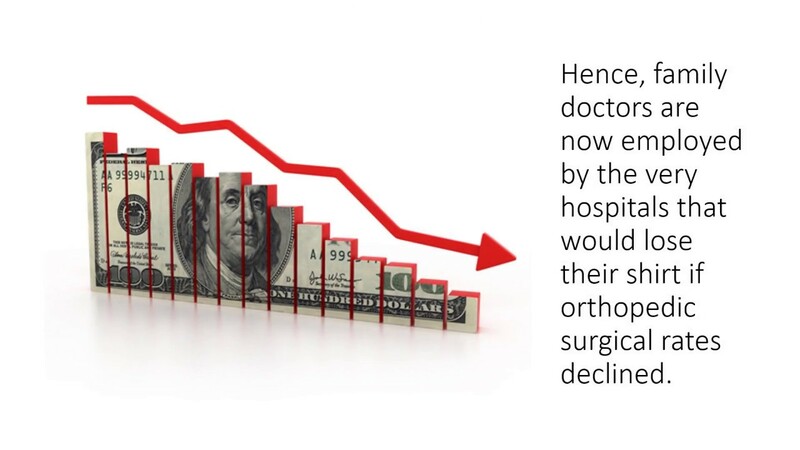 One of the ways to bend that spending curve down is by moving patients from expensive and invasive orthopedic surgeries to less costly outpatient procedures that don’t involve surgery and hospitals. That trend is called interventional orthopedics. However, can orthopedic surgery practices and hospitals lead that radical change? Nope. Let me explain. For any healthcare or hospital system, the largest single line-item cost is orthopedics. However, it’s also the biggest revenue generator, and healthcare systems are always seeking ways to maximize their revenue. This creates a conflict of interest that is ingrained in orthopedics, and it’s a problem that extends to orthopedic surgeons, ambulatory surgery centers, and to the manufacturers of orthopedic devices. None of these entities can afford to lower surgical rates. Why? It would result in languishing surgery-center investments and reduced profits on orthopedic devices. Can’t I Just Reduce Orthopedic Surgery Reimbursement? In recent years, we’ve seen that when orthopedic surgery reimbursement is reduced, this creates another problem —more orthopedic surgeries. I see this every day around me as patients who would never have been surgical candidates just 20 years ago are now getting surgeries quick enough to make my head spin. I see more operations on kids and teens. More procedures in the gray areas where the patient would have been just sent to physical therapy in years past. More neck and back fusions in cases that would have just gotten a simple laminectomy. In addition, another way orthopedic surgeons recover the lost income from lower reimbursements is that they end up creating multiple relationships that cost insurers more money. This takes the form of hospital-owned or partnered practices, surgeon- and hospital-owned surgery centers, and higher device costs. While the ACA ended up providing pre-existing condition insurance coverage (a great thing for patients), it also ended up forcing massive consolidation in healthcare. Meaning it launched countless regional hospital-owned mini-monopolies as these organization raced to purchase medical practices. One of the most profitable to purchase or partner with is orthopedic surgeons. Why? They drive revenue through surgery centers, imaging, and hospital stays. The problem? An insurer loses the ability to contract with many providers who compete against each other and has to accept whatever rates the hospital-orthopedic surgery monopoly is offering. The average orthopedic surgical practice has become a little like airlines. Why? The airlines now make more money off of the credit cards they sponsor than they do flying passengers. In the same way, the average orthopedic surgery practice now makes more money off of its hospital-partnered surgery center or orthopedic hospital than it does from professional fees for the surgeries. Orthopedic device manufacturers have long since figured out how to pay large fees to surgeons who use their devices. This comes in the form of medical director fees, speaking fees, travel reimbursement, research, and in other forms. Once this relationship is forged, this increases insurance costs by placing the most expensive devices at the front of the line, ahead of less costly options or no device options. Take, for example, the million-dollar MAKOplasty machine for knee replacements. Is it any coincidence that Stryker rented out a whole city block of restaurants at the recent AAOS meeting to promote this machine? Between 2013–2016, Stryker paid out almost a quarter of billion dollars to surgeons. The top 10 most highly compensated orthopedic surgeons in America received more than 36 million USD from Stryker during that time. So are all of these orthopedic surgeries at least necessary and helping patients? Look no further than the New York Times article “Why ‘Useless’ Surgery Is Still Popular.” In addition, I have many blogs covering high-level studies concluding that many elective orthopedic surgeries, such as shoulder decompression, knee replacement, spinal fusion, meniscus repair, and much more, are no better than sham surgeries. We’re seeing orthopedic surgeons, hospitals, and insurance companies work toward moving more and more highly invasive and expensive orthopedic surgeries, such as knee and hip replacements, to outpatient surgery centers as an attempt to save costs, which will no doubt result in even more surgeries. 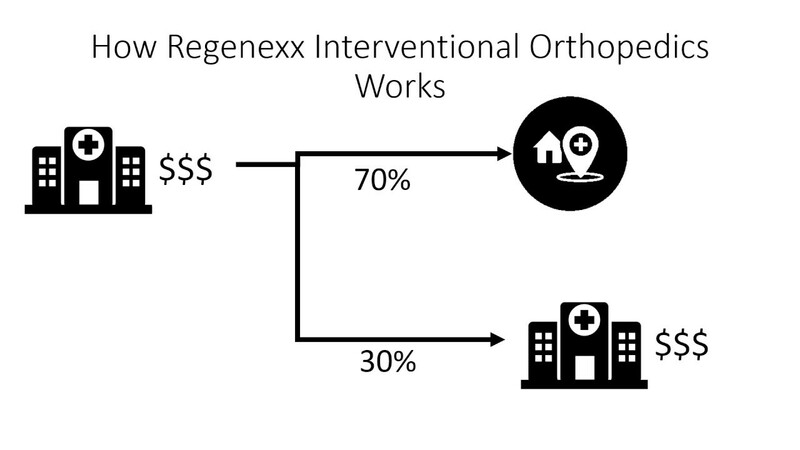 In the field of interventional orthopedics, Regenexx is addressing this by partnering with companies that have created employer-funded health plans to tackle the high costs of elective orthopedic surgeries that are often unnecessary. About 70% of the time, advanced and precise image-guided injections of orthobiologics (the patient’s own stem cells, platelet-rich plasma, etc.) can address the patient’s problem without surgery. So this moves 70% of patients who would otherwise be undergoing invasive orthopedic surgeries out of very expensive hospital systems and ambulatory surgery centers into physicians’ offices. This not only results in a dramatic amount of cost savings but also, and more importantly, keeps the patients from undergoing expensive surgeries they don’t really need. Does this mean an end to orthopedic surgery is coming? No. We still have 30% or more who will still end up in the hospital needing orthopedic surgery. The point is to move orthopedic care toward what is best for the patient, not what is best for the hospital, surgeon, and device manufacturer’s revenue stream, and in most cases interventional orthopedics can effectively treat patients with musculoskeletal conditions. 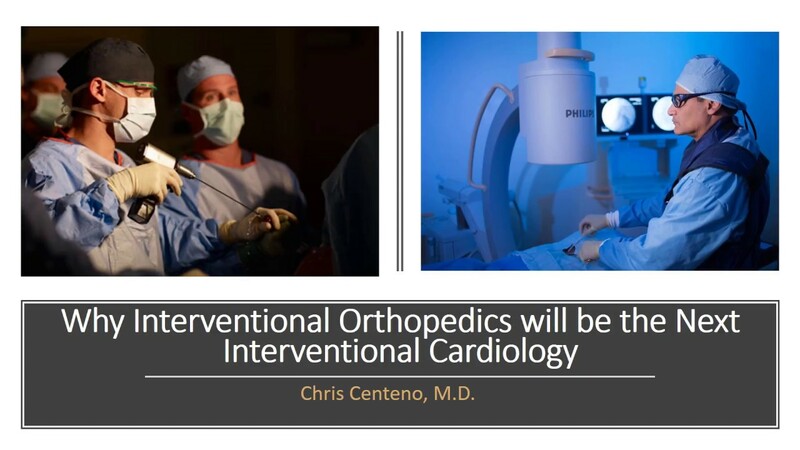 Why Can’t Interventional Solutions Be Accomplished by Orthopedic Surgery Practices? Why can’t this be done by orthopedic surgeons? The problem is that it tends to be cost-plus and not cost-minus, meaning you’re putting the fox in charge of the henhouse. Why? The upshot? Orthopedic surgeons can’t be put in charge of reducing the number of orthopedic surgeries. It’s just that simple.